1. Use dryer sheets to wash dishes. Note: not all dryer sheets are created equal — be sure to use a brand that's non-toxic and biodegradable. 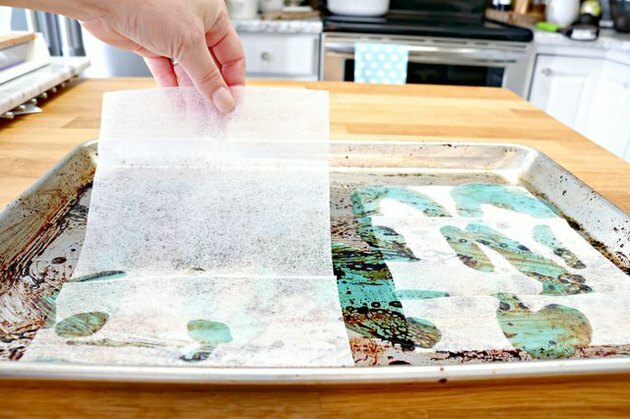 The next time you have an extra dirty pan or dish with baked-on grease and grime, fill it with piping hot water and add a new dryer sheet. Let everything soak for at least 15 minutes and watch as once burnt on foods dissolve like magic. Never waste precious time and elbow grease on a scourer ever again! 2. Use a toothbrush dipped in vinegar to clean an ice maker. Never underestimate the versatile, natural cleaning power of vinegar. When vinegar meets toothbrush, some hidden nooks and crannies get a well-deserved scrub down. One of the most used and under-cleaned pieces of kitchen real estate is the built-in ice maker, which may look clean but its nozzle can easily build up with mold and mildew. Use a toothbrush dipped in vinegar and give it a good scrub. Vinegar is a mild acid that can kill 82 percent of mold species completely chemical free. Simply rinse with water into a cup, and your ice dispenser should be clean and germ free. Do this about once per month. 3. Use rubber gloves to remove pet hair from furniture. One super effective, yet super weird way to remove pet hair from fabric furniture (and even carpet) is to throw on your rubber kitchen gloves and get to rubbing. It works better if the gloves are damp, so why not go straight from doing the dishes to dusting? Pet hairs will stick to the gloves like glue and you'll be amazed by your own efficiency. There is a slight chance your pet will get jealous of your sofa and demand a subsequent belly rub. 4. Use your bathtub to clean oven racks. Expand your perception of what deserves a nice, long bubble bath ... like, your oven racks! I mean, think about it, those things work pretty hard and can easily collect burnt-on debris, plus cleaning them on a regular basis (about every three months) will ensure they don't get rusty or degrade prematurely. Simply remove the racks and place in a tub or shower. Spray the racks liberally with distilled white vinegar, then cover with baking soda and let sit for 10 minutes. Next, douse them with hot water and let sit for another 10 minutes. Use a scrub pad to remove grime, then rinse and dry. Easy peasy. 5. Use rice to clean glass bottles. Glass bottles and vases can be difficult to get completely clean. The fancy, more ornate stuff can't go into the dishwasher for risk of damage, and yet the opening is too narrow to get a soapy sponge to the bottom, so what should you do? Rice to the rescue: start by pouring a small handful of uncooked rice into the bottle followed by some warm water and a squirt of dish liquid. 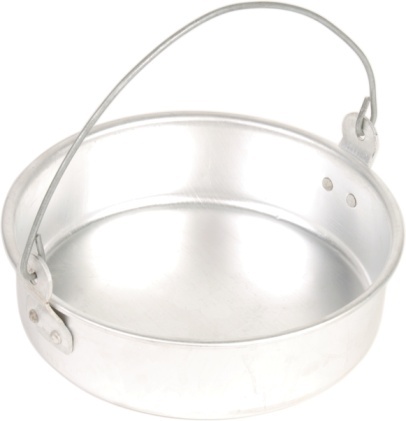 Attach a lid or cover the opening with your hand and give it a good shake. Rinse out with clean water and now you've got a sparkling clean bottle. Let air dry. 6. Use cola to clean toilet bowl rings. Believe it or not, plain ol' cola is just about your best bet at tackling those extra tough toilet bowl stains. Here's why it works: the carbonation in the soda water releases carbonic acid, the mild but effective ingredient that provides enough acidity to erase toilet stains. All you have to do is pour cola or soda into your toilet until it covers the water line, let it sit for a few minutes, then scrub as usual with a toilet brush. On top of being weird, this method is also cheap AF (two liters of Coke will cost you less than two dollars). 7. Use banana peels to clean and polish leather. Warning: if someone happens to catch you in the act of rubbing stinky food trash on your expensive leather furniture, you may get some side eye but we assure you, this one is legit. In fact, the specific texture and oils of the inner part of a banana peel acts as a natural mild abrasive and polish. Make sure you wipe away any banana residue with a microfiber cloth afterward, and then pat yourself on the back for being so darn environmentally friendly. 8. Use WD-40 to remove marker, pencil, and crayon marks. Apparently, WD-40 is pretty much a household superstar. Not only does it remove marker, crayon, and pencil marks from walls, it will also work to buff out similar scuffs on furniture and appliances. 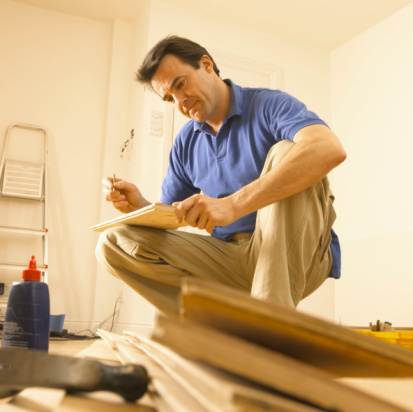 But please keep in mind WD-40 contains oil and will likely stain matte or flat painted surfaces. Once you've sprayed the desired area, wipe the stain away using a clean rag and you'll be able to quickly move on to the next home project. 9. Use mayonnaise to condition wood. No antique is ever beyond restoration or repair, and that's especially true if your prized piece of furniture is made out of solid wood. The simplest, and possibly weirdest, way to revamp your wood furniture is to paint the surface with a layer of mayo. Why does this work, you ask? The oil present in mayonnaise will help moisturize solid wood tabletops to condition the surface and remove stubborn water stains. Cover the surface scratches completely with mayo and then buff them away with a clean microfiber cloth. 10. Use hairspray to remove nail polish from wood. Maintaining natural wood surfaces is difficult, and stressful, particularly when you care a little too much about your prized antique furniture (me). Never before would I dare use nail polish anywhere near real wood. EVER. But, as it turns out, life's greatest mysteries are just one weird cleaning hack away from being revealed. Spray enough hairspray onto the nail polish stain until it's completely covered, leave for 20 seconds and then wipe away. Repeat as necessary until the polish is gone for good.